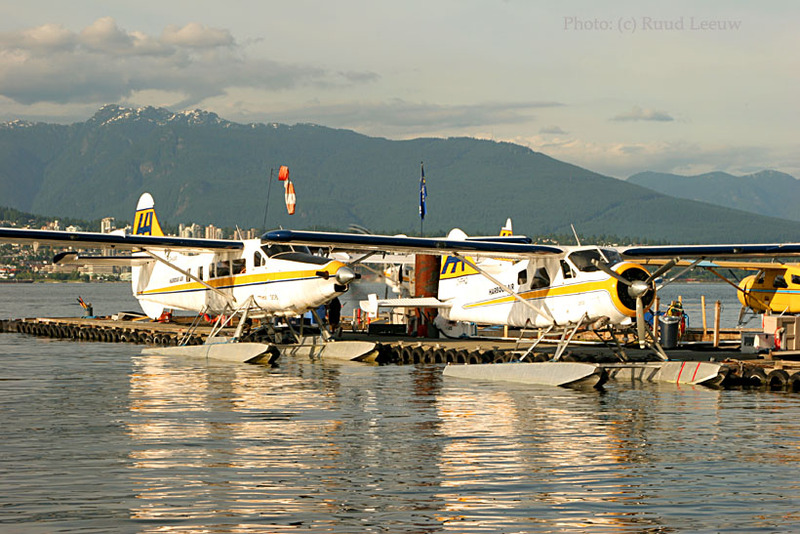 DeHavilland Canada DHC-3 (Turbine) Otter C-GHAR is revving up for departure, while DHC-2 C-FFHQ (both of Harbour Air) remains at the dock of Coal Harbour, Vancouver,BC. Years later I found that another good position to photograph seaplanes in & out of Coal Harbour is from Stanley Park. 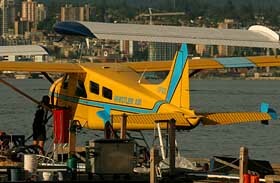 DHC-2 C-FFHQ is c/n 42, so quite an early production Beaver. It was delivered on 18Mar49 and its first tailnumber CF-FHQ was assigned to one H.F.McLean. 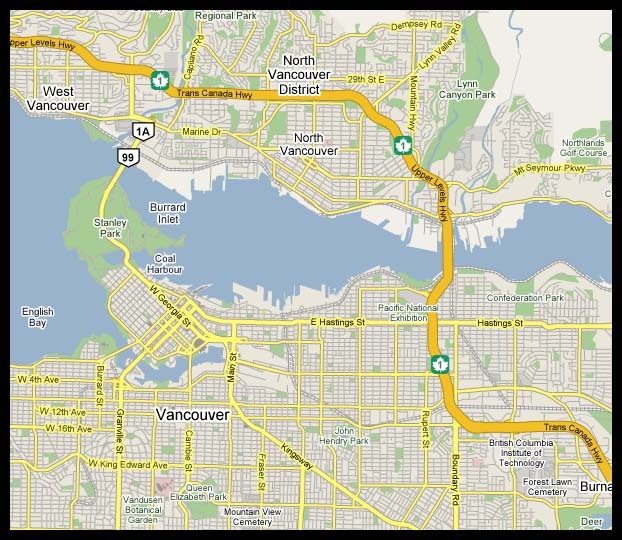 A large gap in its history sees it reported as C-FFHQ on 20Jan83 at Vancouver,BC. It was operated by Stoney Rapids Hotel Inc.,SAS and later by North-Wright Air Ltd. of Norman Wells,NWT. 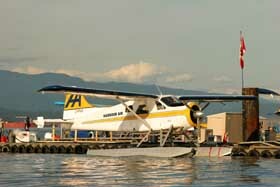 Present operator Harbour Air had it registered on 26May94 Harbour Air Ltd. The de Havilland Beaver is duly credited with opening Canada's northern wilderness for settlement and economic development. 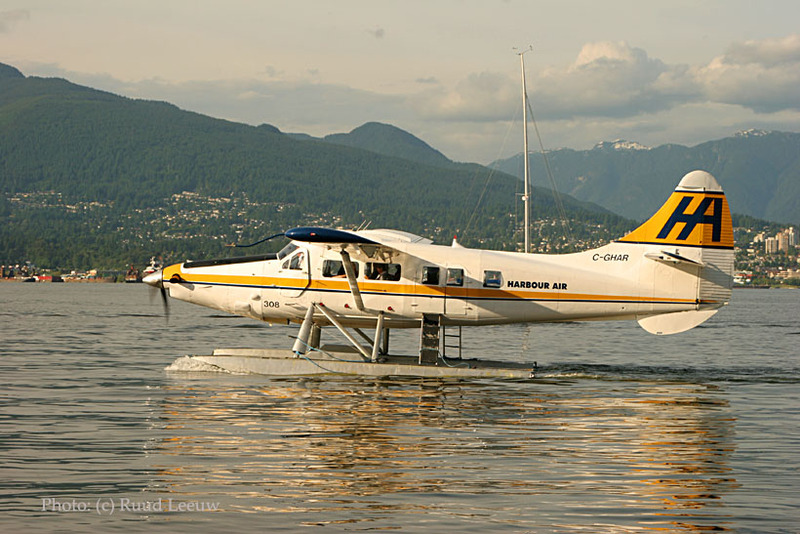 Introduced in 1947, the Beaver remained in production at de Havilland Canada into the mid-1960s, eventually numbering some 1600 aircraft, flying in over 50 countries. With its high-lift wing, STOL (short take-off and landing) capability, and its rugged metal fuselage, the Beaver was tailor-made for bush flying — able to take off and land while bearing heavy loads from just about anywhere. 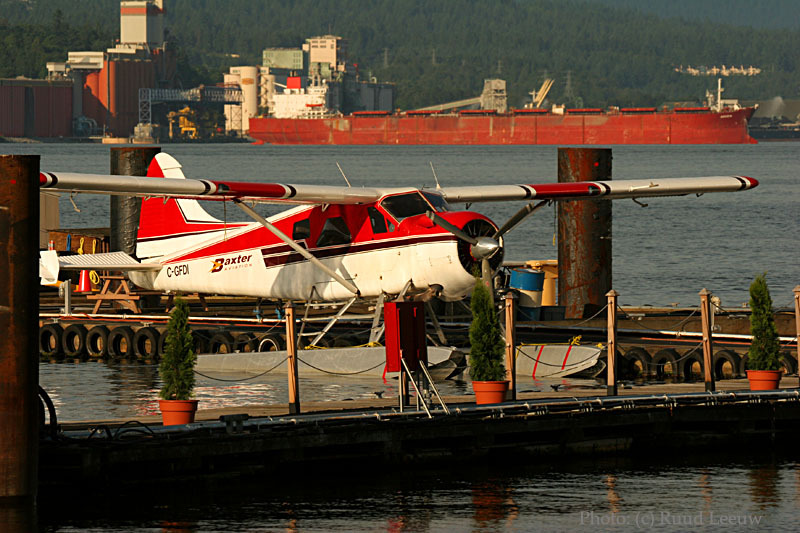 Though ground-capable, the Beaver is far better known in its floatplane configuration. In addition to its role in the Canadian north, the Beaver was employed extensively by the United States Army and Air Force in Vietnam. Parts from these Vietnam-era Beavers are now used as replacement parts for the many Beaver aircraft still flying today. And here we see DHC-3 C-GHAR (c/n 42) moving under own power for departure. It was registered to Harbour Air quite recently, on 19jan06. C-FHAX has its enginecowlings removed and maybe in for some routine maintenance. 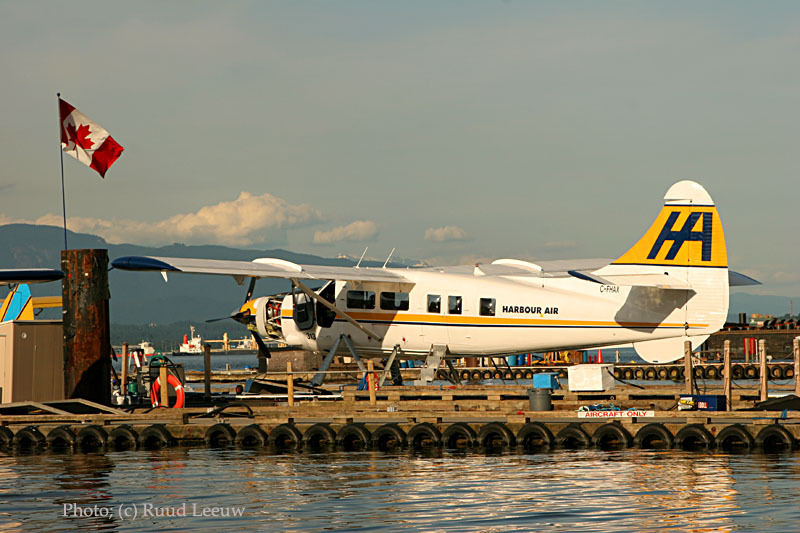 This DHC-3 Turbine Otter has c/n 339 and was first registered to Harbour Air as recent as 25Jan06; its original year of manufacture was 1959 by DeHavilland Canada. C-GFDI of Baxter Aviation enjoys the warm setting sun at the dock here; this is c/n 606. As 53-2810 it was delivered on 09Feb54 to the US Army; its military career ended in the storage yard of Davis Monthan on 14Feb72, which lasted to 26Feb76. 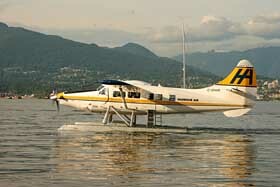 As C-GFDI it was imported to Canada in 1976. During June 1976 it was registered to Airex Prospecting,MAN and on 30Jul76 to G.W. Cox & Sons Logging Ltd. of Campbell River,BC. 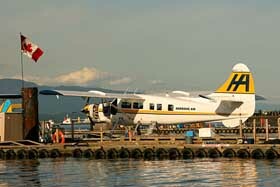 Present owner and operater Baxter Aviation of Nanaimo,BC had it registered on 16Dec96. 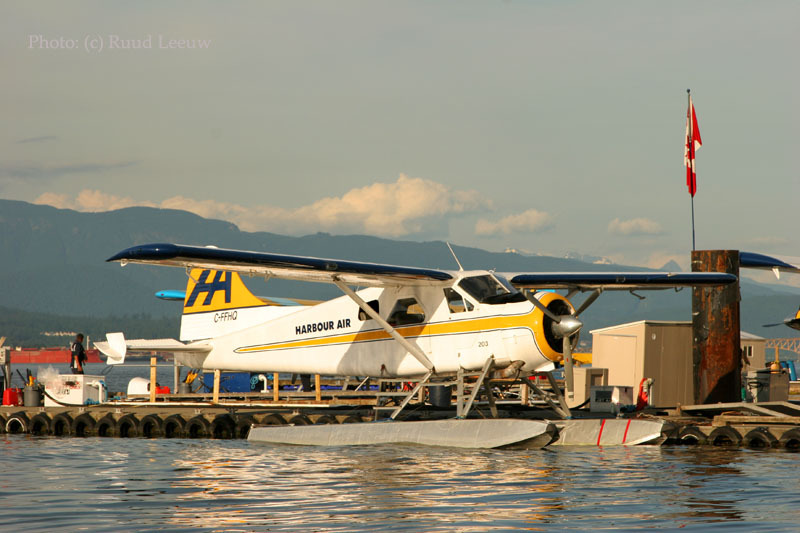 It was hard to find a suitable position to take photos here, due to being late in the day and the sun so low, but I thought this photo of C-FSKZ being refuelled nice enough to include; I had seen it earlier at Vancouver-South Seaplane base. C/n 1594 came off the production line in 1965. As CF-SKZ it joined Hull Air Service. C-FSKZ 497041 became its identification for Ontario Ltd. of Saulte Ste.Marie,ONT (based at Brown's Island). On 22Apr93 it was registered to Plaunt & Son of Sudbury,ONT. 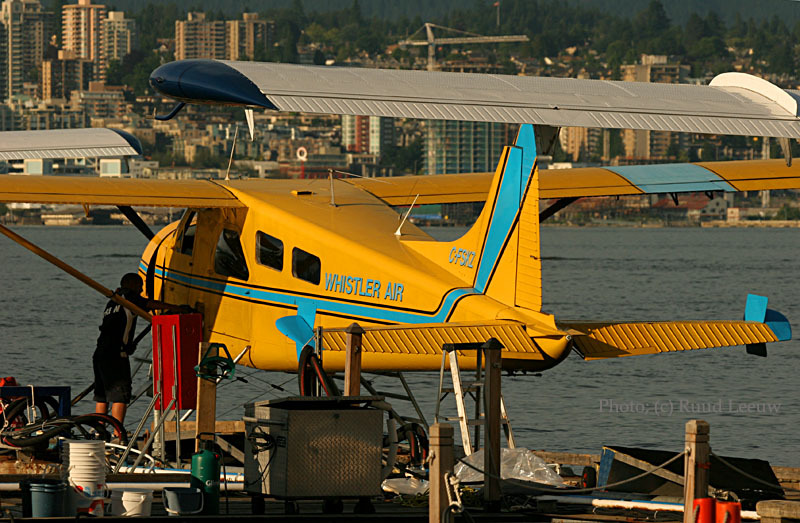 Since 26Apr94 it has been faithfully serving Whistler Air Services Ltd. of Whistler,BC.